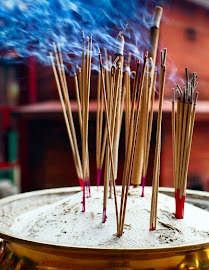 Incense Time Product Reviews: Wonderful News for you Sandalwood Lovers !! Wonderful News for you Sandalwood Lovers !! Nippon Kodo Tendan Sandalwood joss sticks. This is by far the smoothest and most delightful Sandalwood incenses on the market today. It is on order and should be here in no more than 2 days..... More to follow! The Dhoop Factory Incense is Here! !